Directions (1 - 3): Study the following graph carefully and answer the given questions. Preethi and Sharma can complete a work in 30 working days and 20 working days respectively with their full efficiencies. Preethi does work on Tuesday, Thursday and Saturday while Sharma does the work on Monday, Wednesday and Friday. Sunday is always off and Preethi takes Thursday off in 1st week and 3rd week while Sharma takes Saturday off in the week when Preethi does not take off. If Sharma started the work in 2nd December which falls on Monday followed by Preethi on the next day and so on (i.e. they work collectively in alternate days), then the work will be completed in ‘x’ days. Note: Only two week-off is allowed by each of them excluding Sunday and no one takes week - off in the fifth week of the month. 1. Find the value of ‘x’ in the given paragraph? 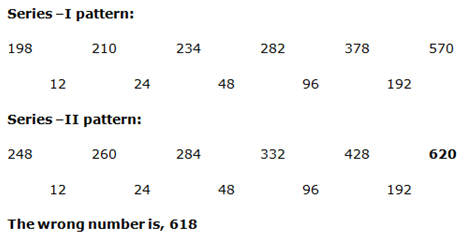 If they take week-off in the week, then their one day work subtracted from 15 units. We got one week’s total work. Total work completed in 16 days. 3. Pipe P and Q can fill an empty tank in (x+6) and (x-4) hours respectively. Pipe P fills the tank in 1st hour and empty the tank in 2nd hour and so on. If Pipe Q opened at 8.30 am and pipe P has been opened at 11.50 am. At what time three-fifth of the tank filled? Directions (4 - 7): The questions below are based on the given Series-I. The series-I satisfy a certain pattern, follow the same pattern in Series-II and find the wrong number in the series –II. Directions (8 - 10): Read the following information carefully and answer the given questions. There are 400 students in a school in which 25% girls. All of them like at least one of the three different fruits viz. Mango, Apple and Papaya. Boys: 10% likes Mango and Papaya together not Apple. 5% likes all the three fruits and 25% likes only Apple. 15% likes only Papaya. Girls: 20% likes only Papaya and 15% likes Mango and Papaya but not Apple. 20% likes only Mango. Find the ratio of the number of boys like Mango to the number of girls like Apple? 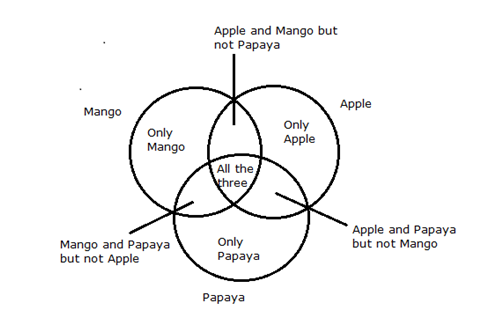 From that, we could not able to find the ratio because there is no information about the number of boys like Mango & Apple but not Papaya. If 20% of girls like Mango and Apple and 15% of girls like Only Apple. 50% of boys like Mango. Quantity III: If the number of girls like Mango and Apple but not Papaya is 2 more than the number of girls like Apple and Papaya but not Mango, then find the number of girls like all the three fruits. 20% of girls like Mango and Apple and 15% of girls like Only Apple. 50% of boys like Mango. 10. If the 20% of boys and 15% of girls like only Mango and Only Apple respectively, then find the difference between the number of boys and girls like at least two fruits. Directions (1 – 3): Study the following graph carefully and answer the given questions. Note: Only two week-off is allowed by each of them excluding Sunday and no one takes week – off in the fifth week of the month. 1) Find the value of ‘x’ in the given paragraph? 3) Pipe P and Q can fill an empty tank in (x+6) and (x-4) hours respectively. Pipe P fills the tank in 1st hour and empty the tank in 2nd hour and so on. If Pipe Q opened at 8.30 am and pipe P has been opened at 11.50 am. At what time three-fifth of the tank filled? Directions (4 – 7): The questions below are based on the given Series-I. The series-I satisfy a certain pattern, follow the same pattern in Series-II and find the wrong number in the series –II. 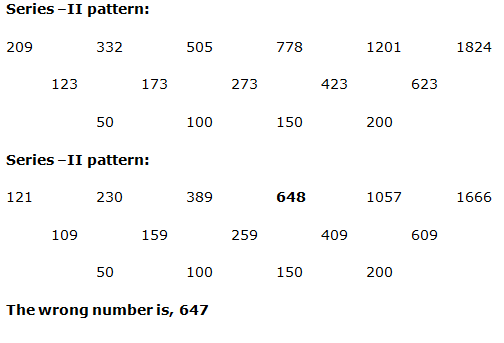 Directions (8 – 10): Read the following information carefully and answer the given questions. 8) Find the ratio of the number of boys like Mango to the number of girls like Apple? 9) If 20% of girls like Mango and Apple and 15% of girls like Only Apple. 50% of boys like Mango. 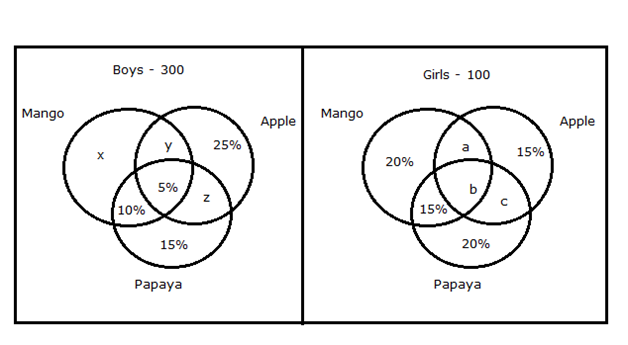 10) If the 20% of boys and 15% of girls like only Mango and Only Apple respectively, then find the difference between the number of boys and girls like at least two fruits.